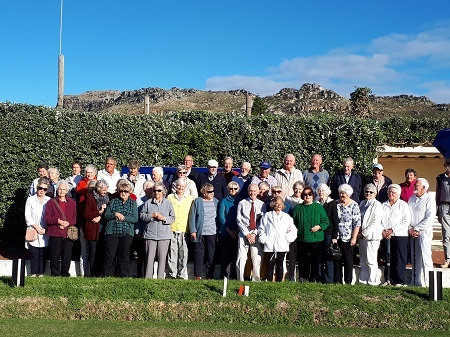 Fish Hoek Croquet Club will be celebrating its 50 th anniversary shortly. The club was established in 1968 and started playing at de Waal Road which is now a parking lot behind the BP garage. In 1969, the club moved to site in front of the town hall provided by the Fish Hoek Municipality. Council created two new courts at the present location in Paris Road. A lease was granted for the courts by the Fish Hoek Municipality. The existing clubhouse was then built by Charles Gainsford. In 1982, the High School was built on the land adjacent to the club and our lease was then held by the Department of Education and subsequently, directly with Fish Hoek High School. swimming pool, a hockey field or cricket nets. Luckily, none of their plans have been implemented to date, but we remain under threat. Like many other sporting clubs, we have been adversely affected by the drought. After much form- filling and approvals, we managed to get ‘treated effluent water’ delivered to the club to save the lawns. For next summer, we will need to have a better solution in place. Given our lack of security of tenure, we are exploring options to re-locate. We hope to decide within the next few months. Our 50 th anniversary will be celebrated with a ‘High Tea’ and fun games on 29 July. This entry was posted in News Articles on 14th July 2018 by Jeremy.